This is a review of NuHair’s Hair Rejuvenation for Men supplement. This product claims to contain ingredients that can aid in the stoppage of hair loss. It also claims to promote a healthy scalp, as well as slowing the body’s natural loss of hair color as you age. Continue reading this article to find out if this is the right product for your hair growth needs. After reviewing the recommended dosage provided by NuHair, it is suggested that individuals take 2 tablets daily, with food. This product is not recommended for individuals under the age of 18. This product is specifically formulated for men, and is not recommended for women. After looking into the levels provided by NuHair, we feel confident in stating that this product does indeed contain high enough levels of the active ingredients and compounds to have a noticeable and positive impact on the human body. NuHair recommends at least 3 months of constant use before any noticeable effects can be seen. NuHair states that no side effects or drug interactions are known to exist. However, there always exists the possibility for specific nutrients to interact with medications, and because of this, individuals should always keep their health as their first priority when selecting a dietary supplement. NuHair recommends that if individuals have any questions concerning specific drug interactions, that they should always consult their physician first. One bottle of Nu Hair’s Rejuvenation Supplement for Men costs $38.49, and contains sixty pills, enough for a 1 month supply. No subscription program seems to be available at this time, nor are there any discounts offered for bulk orders or first-time customers. Any reviews contained on the company’s web site were completely positive, which leads us to wonder if they are presenting the entire argument fairly and accurately. 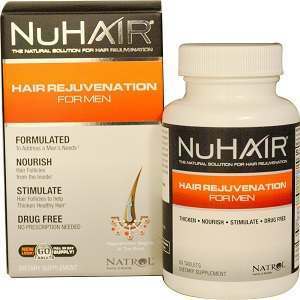 NuHair offers no guarantee for its Hair Rejuvenation for Men supplement. After scouring the company’s website, no clear return policy could be found, although some language did suggest that one exists. This makes us extremely uncomfortable, as any product that doesn’t offer a clear return policy for even damaged or mishandled items creates an unsafe environment for the consumer. NuHair’s Hair Rejuvenation for Men supplement is not a product that we can recommend. Yes, the company does indeed offer their product at a competitive cost for the amounts included in each bottle. Also true is that their supplement contains quite adequate levels of the active ingredients that NuHair claim make their supplement so effective. But unfortunately, they offer no return policy for standard problems that consumers will inevitably encounter in shipment, like damage to the product itself, or loss. Also, for all the strong claims made on NuHair’s web site, a lack of any sort of guarantee makes us wonder if NuHair truly trusts their product’s effectiveness as much as they say. John Brownstone	reviewed NuHair for Men Hair Rejuvenation	on June 30th	 and gave it a rating of 2.5.